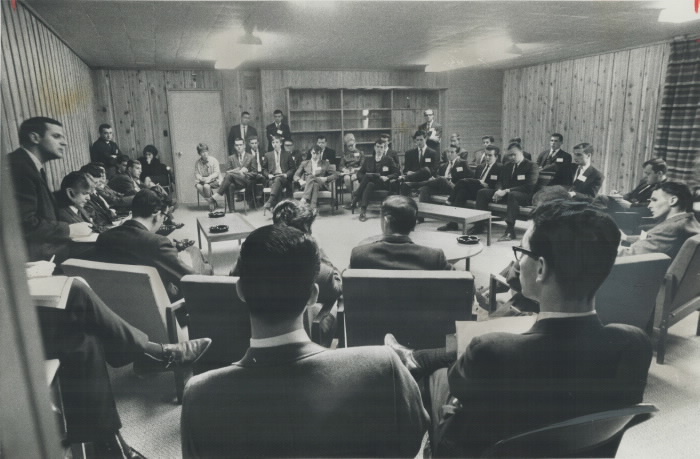 Biculturalism under study: A group of students from the French University of Sherbrooke, 19 March 1964. None of these well meaning, serious looking students, were aware these hearings were already caught up within a spiral of radicalization. What everyone has missed is the incipient possibility that these hearings were the last best effort to forge a Canadian nation based on both Anglo and French cultural nationalism. Despite the Commission's recommendation for a bicultural Canadian national identity, the increasingly globalized elites of the late 60s and early 70s decided to ignore totally this recommendation in the name of an artificially constructed multicultural identity open to branch-plant American capitalism. Rather than the lame interpretation that the aim of this Commission was to promote better cultural relations between the anglophone and francophone communities, help Canadians become bilingual in English and French, and, in this way, work out a solution to the threat of separatist nationalism in Quebec, I would emphasize the spirit of Canadian bicultural nationalism embodied in the Commission's work. The English Canadian public was still nationalistic in the 1960s, not in a nationalism based on ethnicity but more in a bicultural nationalism unafraid to declare that Canada was made up of two "dominant" cultures, Anglo and Quebecois. The Quebecois were still quite ethnocentric in their national identity, but English Canadians did hope that by emphasizing the founding dominance of both French and English peoples a bicultural solution to Quebec separation could be found. This bicultural recommendation, however, would never come to fruition. The spiral of radicalization was in full swing between 1963 and 1969, not only were non-Europeans arriving in numbers higher than ever, but the Anglo elites were more interested in American branch-plant capitalism than in accentuating Canada's bi-cultural heritage. Trudeau understood this, and so in 1971 he rejected Canada's bicultural nationalism in the name of a civic multicultural identity. What is cultural nationalism? Wikipedia provides a short and efficient conceptual mapping in stating that cultural nationalism occupies "an intermediate position between ethnic nationalism on one hand and liberal nationalism on the other." Cultural nationalism focuses "on a national identity shaped by cultural traditions and by language," unlike ethnic nationalism, which focuses on common descent, blood or kinship; and unlike liberal (or civic) nationalism, which focuses on the "Western" values of freedom, tolerance, and equality. In the standard literature to which Wikipedia subscribes, civic nationalism is seen as the most "inclusive" nationalism for its claim that a nation can be liberal only if it advocates the inclusion of multiple ethnicities and cultures. But it seems to me that ethnic nationalism is the most inclusive, since a nation that focuses on ethnic ancestry will automatically focus on the cultural traditions of the ethnic group(s) with a true historical ancestry in the nation, their languages, religions, customs, and habits; and, if this nation happens to be liberal in its values and institutions, it will also emphasize equal individual rights in its national identity. In contrast, cultural nationalism does not tolerate ethnic nationalism, though it does tolerate civic nationalism insomuch as liberal values may be part of the nation's culture. Civic nationalism, on the other hand, is intolerant against both ethnic and cultural nationalism. In earlier parts I defined Canadian nationalism up until the early 1960s using the term "ethnic liberalism," a nation conceived for people of European ancestry with liberal values. 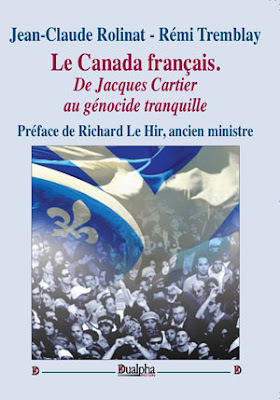 With the 1962/1967 Regulations, every remaining trace of ethnic nationalism was officially discarded in Canada, though it should be noted that the Quebecois then were a people with a strong sense of ethnic identity, even as the Immigration Regulations, and other human rights legislation, were demanding that Quebec, as a province, forego its "racist" nationalism. Unlike the rather homogeneous race of French Canadians, what stood out among English Canadians in the 1960s, socially and institutionally, was their sense of cultural nationalism, still intermingled with ethnocentric dispositions, a sense of Britishness involving an amalgam of hybrid ethnicities from the British Isles, but best identified as a form of cultural nationalism — what George Grant identified as a "stronger sense of the common good and of public order than was possible under the individualism of the American capitalist dream" (Lament For A Nation. The Defeat of Canadian Nationalism  Carleton Library Edition, 1970). This Canadian cultural nationalism came out of a tradition of British Tory conservatism, a tradition that was barely existent in Britain by the 1960s, but which the Canadian Anglo majority still subscribed to, in combination with a host of unique traits nurtured in the cold soil of Canada, folkways, songs, amusements, historical experiences. This Anglo nationalism recognized that Canadians included other European ethnic groups rooted in Canada, and that in Canada there was another founding people, the Quebecois, with a very different culture within the province of Quebec. The Royal Commission reflected this bi-cultural nationalism in its Report. However, during the years these hearings were conducted, from 1963 to 1969, the spiral was gaining much ground under the auspices of American global capitalism. Conservative Prime Minister John Diefenbaker was utterly defeated early in 1963, after winning a solid majority in 1957, along with his folksy prairie sentiments, or what remained of his cultural nationalism, always confusedly weak, as testified by his passage of the Canadian Bill of Rights of 1960, which undercut further Canada's historic allegiance to British liberties, the idea that Canadians had liberties as members of a British Canada, not as member of the human race. Under Prime Minister Lester Pearson (1963-1968), the Canadian nationalist Red Ensign flag was replaced by the generic Maple Leaf in concert with the subsumption of Canada's economy under American globalism. Hitherto Canada's identity had been able to manifest itself co-extensively with British rule and cultural ties. In 1900, while 85 per cent of foreign capital invested in Canada was owned in Great Britain, this capital, and British investments generally through the 19th century, came largely "in the form of debt that was paid back and concentrated in railways, construction of utilities and funding of governments." In other words, British capital served the making of Canada as a nation across a huge landmass. American investments in the 20th century, in contrast, were directly controlled by American companies, "allowing permanent ownership and control of enterprises." While the British share in 1955 had declined to 17 per cent, the US share had mushroomed to 77 per cent. A report of the Task Force on the Structure of Canadian Industry published in 1968, the year Pearson ended his tenure, concluded that "the extent of foreign control of Canadian industry is unique among the industrialized nations of the world." Through the 1950s and with intensity during the 1960s Anglo Canadian elites willingly bought into the "progressive" nature of American corporate internationalism and its agenda of consumerism and abstract individual rights without a nationalistic sense of the common good. Much as the conservatives tried to fight for a sense of Canadian identity and public good, by creating Ontario Hydro, the Canadian National Railway, and the Canadian Broadcasting Corporation, they could not withstand American globalism. Instead the socialist liberals in Canada appropriated the concept of the common good while depriving it of any cultural content. The common good was reduced to progressive taxation for the purpose of promoting working class internationalism and human rights in a Canada open to the whole world. At the same time, the 1962 and 1967 Regulations were having immediate effects in the ethnic composition of the immigrants as the hearings on biculturalism were being conducted, making Canada multi-cultural. This Commission, in fact, underwent some crucial changes in its use of language and in its objectives, during and after the regional and public hearings held across Canada in 1964 and 1965. By the time the full report of the commissioners was assessed and deliberated upon between 1969 and 1971, the Commission's starting objective was radically transformed from an effort to acknowledge the "Bicultural" character of Canada into an announcement by Prime Minister Trudeau that Canada was a "Multicultural" nation. The Report of the Royal Commission on Bilingualism and Biculturalism, General Introduction, Book I, The Official Languages, published in 1967, takes issue right from the start with the use of the term "founding races," a term long used by historians and by government officials since Confederation. This term was used in reference to the British and French founding peoples, not in order to differentiate these two groups in biological terms but merely as a term that was used interchangeably with "nationality." Everyone was aware that the French and the English were two strong national peoples constantly fighting with each other, though both Christian and both original members of the European continent. But by the time this Report was written, the term "race" had been discredited; the Report was signalling to its audience that it was abandoning this term, clearly stating that in its terms of reference "there is no mention of race, people, or ethnic group but 'of the basically bicultural character of our country and of the subsequent contribution made by other cultures.'" (Report, pp. xxi-lii). Yet, as one reads carefully between the lines of the section entitled "The Key Words of the Terms of Reference," the transpiring message is that the term "ethnic group" will be used in reference to groups that are not Anglophone or Francophone. There is a section on the "the contribution of other ethnic groups" to Canada, with the implicit awareness that besides the English and French, there are "other ethnic groups" in Canada, and that the members of this group have a strong sense of ethnic lineage. In contrast, the Report identifies Anglophone and Francophone communities as "cultures," and it calls Canada "bi-cultural" on the grounds that these are the two founding cultures, the "two great, distinct cultures in our country...the two dominant cultures in Canada...embodied in distinct societies." To its credit, the Report takes seriously the meaning of culture, the way in which culture affects "the group's manner of thinking and acting," and the fact that both the French and the English possess distinct institutions, languages, and traditions. A truly bicultural Canada is one in which members of both founding cultures enjoy equal partnership in participating in the nation (Report, pp. xxi-lii). The commissioners were aware that the Quebecois did have a stronger sense of ethnic ancestry than English Canadians, but the hope was that by including Quebec as an equal partner in the making of "bicultural" Canada, this ethnic nationalism would be mitigated. Liberalism, we have been arguing in this series, lacks a concept of the political, of the idea that a political state is a collectivity of people with similar ancestry. In the face of the new norms of human rights, race is a construct, and ethnic nationalism is bad, British and French Canadians were expected to forego their ethnic attachments. On the other hand, we have just seen that the Report implicitly recognized that non-British and non-French groups were still strongly attached to their ethnicity. Herein we have in embryo a justification for our current policy of multiculturalism which recognizes the ethnic group identities of non-Europeans, as well as their individual rights, but only the individual rights of Eurocanadians. The Report, however, did emphasize the collective bicultural identity of Canadians. But this emphasis was short-lived, soon to be discarded in the name of multiculturalism. During these hearings, when Canada's European population constituted about 97% of the total population, and when ethnic groups consisted of other Europeans, the commissioners had no idea they were in the midst of a spiral acquiring ever more momentum, one that was about to question even the "bicultural" character of the nation. The could not even anticipate that merely two years after the release of the recommendations, under Pierre Trudeau's leadership, Canada would be redefined as a nation by and for individuals from all the cultures of the world.